The USMNT’s Gold Cup opener was their first competitive match since the World Cup, and in the broadest sense, it’s all about the next one. Jurgen Klinsmann has said repeatedly how 2015 is a year of “transition” for the roster—reloading, getting younger, starting up the position battles that will play out from now right up until Russia 2018. But the Gold Cup itself was always to be an anomaly; Klinsmann has said all along he planned to bring his best roster, because he wanted to win this thing. That part, at least, is off to a good start. 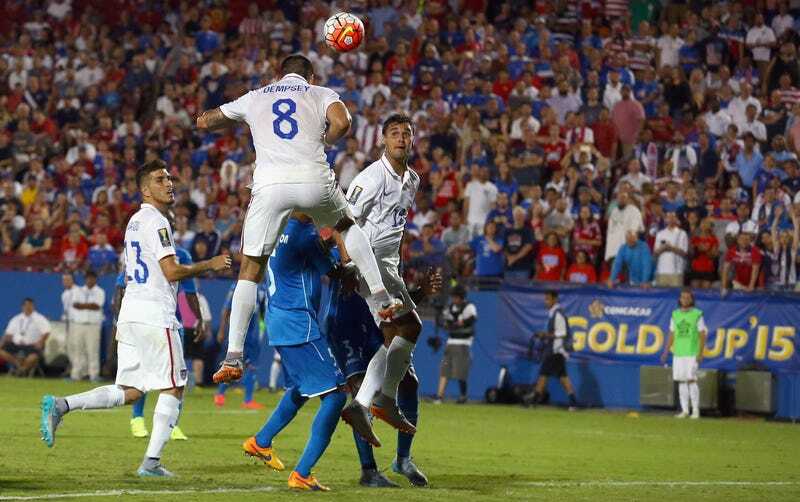 It was old standby Clint Dempsey’s two headers that gave the U.S. the 2-1 win over Honduras. In a stricter sense, to Klismann, this Gold Cup is a qualifier. Outside of World Cups, the U.S. doesn’t get to play meaningful matches against European and South American sides—unless it can reach the Confederations Cup. After winning the 2013 Gold Cup, a win in this tournament would send the U.S. directly to the 2017 Confed Cup in Russia (a loss would set up a one-game playoff between the U.S. and the tourney winner). That Confed Cup is Klinsmann’s penultimate goal, and establishing America as CONCACAF’s true power this month would just be a nice added bonus on the way to getting there. They got off to a slow start, feeling out a defensive-minded Honduran side, and looked downright vulnerable over the final 20-plus minutes, conceding once, hanging on for dear life, and being lucky to walk away with three points. The backline was rough, the midfield occasionally ran around like headless chickens; there is a lot of stuff to work on. But in between all that, new captain Michael Bradley and old captain Clint Dempsey were their shining selves, and were involved on both U.S. goals—both set pieces, naturally. It’s a weird time for Dempsey. Last month, he melted down on a referee and earned himself a hefty little suspension. Last week, Klinsmann transferred the USMNT captaincy to Bradley, saying he wanted to “take the heat off of Clint.” The manager said he wanted Dempsey to focus on scoring goals. With his brace last night, he’s up to 43 international goals in his career, just 14 behind Landon Donovan’s American record.